We believe in a poetic treatment of a complex reality. 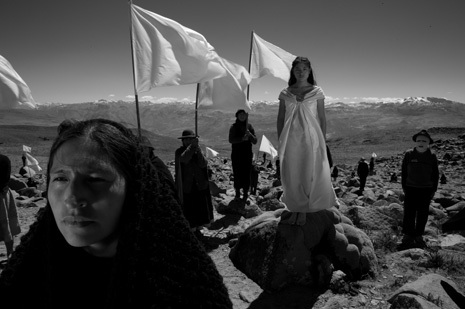 ALTIPLANO offers the viewer the possibility to reflect on injustice, accountability, faith and redemption. Our point of departure in the writing process was reality. For example, the devastating mercury spill in the Peruvian village of Choropampa in 2000 inspired several of the concepts of ALTIPLANO. As storytellers, we are drawn to upheavals that strike the cords of global public debates on ethics and responsibility. In the case of our first feature, KHADAK, we looked at the ravages of greed on a nomadic culture. At ALTIPLANO's heart is an ongoing invisible conflict in the Andes. We say 'invisible' because many individuals who take up arms against the industrial giants operating in the mineral-rich Andes disappear. We say 'invisible' because there is so little profound coverage of these conflicts in our media. But our intention is not to illustrate injustices. ALTIPLANO should evoke an inner dialogue and, ideally, leave an indelible mark etched on the soul of the viewer. We believe in humanist cinema. We have made films in Peru, Mongolia, Ecuador and Morocco, but we firmly reject exoticism, which focuses on the differences between people and their cultures and which thrives on clichés and prejudices. We believe in a respectful dialogue between cultures, which is linked to an introspective dialogue with our respective pasts. ALTIPLANO offers the possibility of rediscovering values and attitudes towards life that were buried long ago in European spiritual patrimony. The film is built upon moments of trauma and loss but is, fundamentally, an expression of our faith in the possibility of mutual understanding between people. Grace is a war photographer who has lost her soul in Iraq. She suffers further grief at the loss of her husband. In Peru, the young Saturnina sacrifices her body in protest against corrupt outsiders. Saturnina's spirit and Grace's body eventually touch, thus infusing one another with purpose and power. This symbiosis reflects our conviction that we, mankind, share a common destiny and, therefore, could potentially share a common sense of responsibility. We believe in spiritual cinema. Both history and non-western cultures remind us again and again that rationality cannot be the dominant approach to life. They warn us that this ongoing process of demystification may lead to destructive forms of anti-humanism. Spiritual cinema reminds the viewer of the healing power of wonder; it suggests the need for synthesis over analysis; it honours the complexity of our world; it evokes the sacred; it invites us to be humble and grateful; it respects the mystery of our existence. Tarkovsky stated it very clearly: "It is always through spiritual crisis that healing occurs. A spiritual crisis is an attempt to find oneself, to acquire new faith." We admire the cinema of Tarkovsky, Paradjanov, Antonioni and Angelopoulos, among others, who imbue their films with a sense of mystery. In an inexplicable way their films continue evoking powerful feelings, emotions and images long after we have seen them. Mystery, we believe, is precisely what is lacking in today's cinema. We believe in thorough research. We listen to people. We read their histories, study their beliefs and learn their languages. Most importantly, we spend time in the places we film. Only after having proven the integrity of your intentions do people and places offer you the most wonderful raw material that allows you to build a unique film that is deeply informed by reality. Saturnina's death, for example, is based upon a peculiar form of suicide which is common in certain parts of Latin America - the protest suicide - which Peter studied in the early 90s during his years spent living between Ecuador and Peru. In fact, Peter's first documentaries feature an Andean community that is plagued by alcohol, suicide and destructive foreign aid strategies. ALTIPLANO is not a film about Peru but a film created with Peru. It is not the appropriation of exotic imagery packaged for consumption by another. It is, first and foremost, the result of a long journey inwards where we examined our presumptions and rummaged through our archives of experiences, all the while searching for revelations. We believe in strong characters. The characters we have created are strong but not in line with Hollywood's demand for 'strong character', which requires clear motivation and certain given conflicts that must be faced and resolved. We present characters from the outside thus forcing the viewer to search, to study, to consider multiple possibilities that could make up an identity. We offer enough information about what a protagonist has lived through so that the viewer can freely imagine the rest. We grant the viewers the space they deserve to imagine, to ponder and to wonder. We believe in the power of images. The aesthetic principle of our films does not lie in beautiful images but in the inherent tensions within and between the images. Through their style our films intend to transcend the cultural and historical peculiarities of their locations. They are an invitation for contemplation of the human condition with its ongoing movements and tensions between creation and destruction, life and death, past and future, body and soul, growth and decay. Through its style - and form - ALTIPLANO seeks to evoke wonder, thus becoming the raw material for a potential aesthetic experience. We believe in the audience. Spirituality belongs to all ages and all cultures but very few films today move the soul. We believe there exists an audience around the globe for films like ALTIPLANO and KHADAK. And this audience is not composed of just cinephiles. The most remarkable reactions to KHADAK came from 18-year-olds and non-cinephiles. Unfortunately, between the filmmakers and the audience lies an entire audiovisual industry that controls the mechanisms of distribution. Because of 'economic necessity' many grand films never ever reach an audience. We depend on a few brave intermediaries to bring a film to life. Perhaps in the future new technologies will reduce the cost and hardship of reaching an audience but for the moment we also rely on old-fashioned word-of-mouth.